The time period covering New Kingdom is 1570 BC - 1070 BC. This is the era in Ancient Egypt with which most of us are familiar because of the famous Pharaohs who reigned during this era including King Tut. 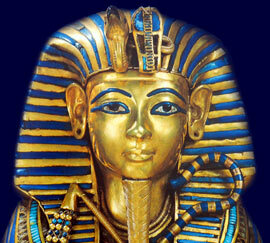 The names of the Pharaohs who ruled during these dynasties of New Kingdom are detailed below. Our Egyptian Timelines provide a time driven list Ancient Egyptian pharaohs, periods, kingdoms and dynasties provide the generally accepted dates of each of these times - a chronology or list of dates of all the periods, kingdoms and dynasties of Egypt. So if you are interested in New Kingdom then the important people and events, via a simple timeline, charting the key dates in Ancient Egyptian history will prove to be interesting.